I believe in putting my money where my fork goes. I prefer shopping at a farmers market. I like posters that remind me “if you ate today hug a farmer”, although I have yet to actually hug a farmer! I had a great time recently visiting Farmers Markets north and south of Barrie; in Innisfil and Orillia. I hope dear readers that you will explore the markets, purchase some amazing local foods, and maybe be inspired to hug a farmer or two! First stop was the Innisfil Farmers Market; it runs Thursdays from 2-7 p.m. seasonally at the Innisfil Recreational Complex, with ample free parking onsite. This is the 4th year for the market, which started as a pilot project for the Town of Innisfil under their Inspiring Innisfil 2020 forecast. Rob Radcliffe is the Chair this year, and with an ever growing roster of vendors, Georgian Hills Vineyard about to join in with their VQA wines, this is a great place to shop! Weekly entertainment is provided. Special events are held, from strawberries to BBQ’s, corn roast to apples, a celebration of the fall harvest with a pumpkin festival in the fall. The market has a friendly energy you can feel, cheerful balloons and signage help showcase the vendor of the week. I found Holly’s Sweets & Eats, which I consider hands down Barrie’s best bakery side-by-side the family owned Ficklewood Farm. We tried their pork sausage on a bun with onions and red peppers and tasted their pulled pork; both are nicely seasoned, very tasty indeed. I purchased an amazing cheese, caramelized onion and bacon bread, which made fabulous BLT sandwiches for lunch on the weekend! I sampled some delightful maple products from Everything Maple and More, and learnt they had been on Dragons Den pitching their wares. A flower booth was blooming lovely, Cookstown greens; known for their outstanding produce had baskets of bounty. Indeed all the vendors were most welcoming. Highly recommended. 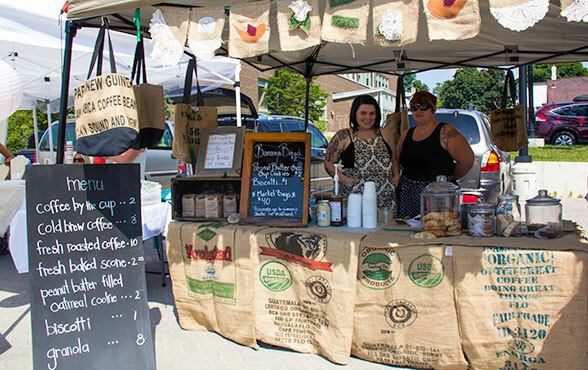 Orillia now boasts two markets; while historically downtown was the home for the original market, changing times and locations resulted in the creation of two markets. The Orillia Fairgrounds Farmers’ Markets situated at ODAS Park, open Saturdays 8-1 p.m. is mandated to support farmers and the farming community, so a country location with a grassy treed site is the perfect home for their 52 vendors. As market manager Anne Lesperance shared with me, customers tell her “This feels like a good place for a Farmers’ Market to be”. I happened to attend on Strawberries and Cream event day and was duly impressed. This was a joint fundraiser for the market and The Sharing Place Food Bank in Orillia. Kawartha Dairy donated the ice cream and the monies raised were split between the food bank and the farmer’s market. The market portion will go toward the building fund as a contribution to their winter home. Anne Lesperance explained that with new refrigeration units at the food bank, they are now able to accept fresh produce from vendors at both Orillia Farmers markets. Vendors are able to donate to the Sharing place, which means that members of the community in need, are able to access fresh produce. A unique find I discovered at the market was a mobile wood burning oven. I was familiar with some of the vendors as they are also at “my” home market in Barrie. It was good to see McBride’s Organics and Black Angus Farm Gate and to meet new vendors, Just Say Cheese and Franni Granola amongst many others. I found Simply Tea and Chocolate situated here, having known them from a Barrie locale too! The market has a wide variety of unique events scheduled for the season, including a Buskerfest, Medieval Festival, College /University Student Scavenger Hunt, Three Sisters Celebration and more. As they say “they make it, bake it or grow it”, go check it out! Orillia Farmers Market- Downtown is the oldest business in town; literally, dating back to 1842, so their motto “Get your boots to the roots” is absolutely apropos! Changes have taken place, but now that the downtown market is firmly grounded at the library the tradition of bringing farm fresh foods continues. From the oldest to the newest, trend setting food vendors are making this a niche market and food folk are rejoicing. The market has booths from two local restaurants that base their menus on locally grown foods sourced from the farmers market. Yummy and reasonably priced breakfasts are available for the early risers from Bistro 179 and Tre Sorelle, known for their Italian specialty items are regulars. My taste buds were thrilled to eat at Fox Foods, their tacos and “foxsicles” have me craving more. Thankfully they are opening a resto this fall in Orillia. Oh Editor take note, I am going back! Midland’s Grounded Coffee has a booth here; theirs is the daily brew in my home. It was great to see the Pretzel People again too! Pat Loewen, is the Manager of the Orillia Farmers Market, she was the original start up 23 years ago with the Gravenhurst Farmers’ market, and she knows food! This is the first farmers market where I had the vino experience, as Pillitteri is the resident wine vendor. 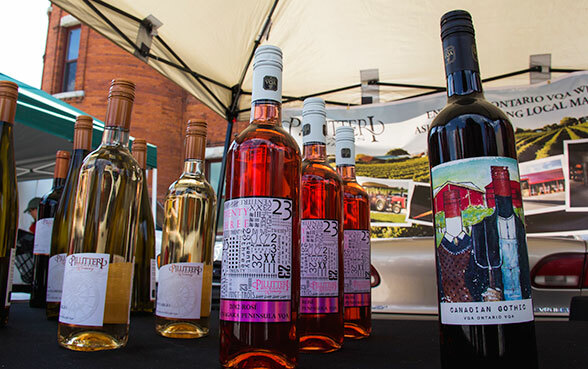 This being the first year 100% VQA Ontario wines can be sold at farmers markets. Frankly it seems a civilized, logical extension of supporting local growers and producers to me. So please check out the farmers markets, support local, hug a farmer, grower or food producer and put your money where your fork goes!